This is loosely inspired by a Dan Lepard recipe that featured in The Guardian a while back. My sister makes amazing muffins, but I am less of a sweet tooth, so upon realising that you could just as easily make savoury ones I leapt to the challenge. To me, these make a perfect lunch on the go - small, quick to eat, and very tasty. A little bit like a portable pizza. These are fluffy and moist but faintly spicy and with a slight bite from the courgettes and olives. Yum. In a large mixing bowl, beat the eggs together with the milk and olive oil, then add the salt, pepper, chilli flakes, smoked paprika, cumin and coriander powder. Next, finely chop the coriander leaves and thinly slice the spring onions and olives and add to the mix. Then grate in the courgettes and add the grated mozzarella. Mix thoroughly. Finally, weigh out the flour and sift into the mix along with the baking powder and fold in until fully amalgamated. Line a 12 hole muffin tray with paper cases and divide the mix evenly among them. Bake in the oven at 180C for 25 minutes until they have risen and are a gorgeous gold colour. Allow to cool for about 10-15 minutes before eating - you might burn your mouth otherwise! so glad it worked well for you! it's really lovely when something works for other people too and it's not just fluke or me having weird taste buds! 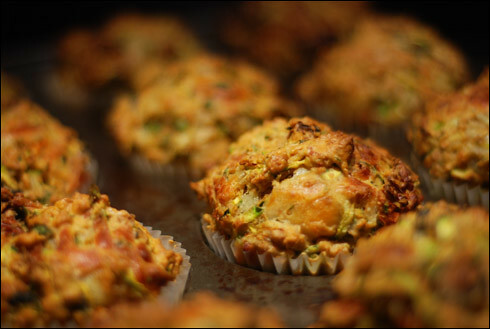 I've never tried a savoury muffin, you have inspired me to give it a go! oh, they're lovely and make an excellent breakfast on the go or savoury treat. very versatile too - as with normal muffins there's allsorts of things you can put in them. I've just tried these and they taste brilliant. I'm already thinking about variations in my head. So easy to make and tasty. Thank you so much for the recipe. so glad you enjoyed them! totally with you on the planning new variations too - they're so much an "anything goes" combination. i think crispy bacon & sundried tomato would be nice. Almost a fry-up in a muffin!